Pope Anastasius IV (c. 1073 – 3 December 1154), born Corrado Demetri della Suburra, was Pope from 8 July 1153 to his death in 1154. 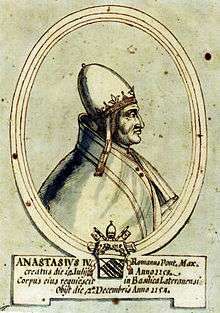 He is the last pope to take the name "Anastasius" upon his election. He was a Roman, son of Benedictus de Suburra, probably of the family of Demetri, and became a secular clerk. 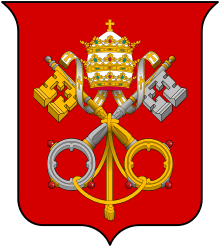 He was created cardinal-priest of S. Pudenziana by Pope Paschal II no later than in 1114. In 1127 or 1128 Pope Honorius II promoted him to the suburbicarian See of Sabina. He had taken part in the double papal election of 1130, had been one of the most determined opponents of Antipope Anacletus II and, when Pope Innocent II fled to France, had been left behind as his vicar in Italy. At the time of his election to the papacy in July 1153 he was Dean of the College of Cardinals and probably the oldest member of that body. During his short pontificate he played the part of a peacemaker; he came to terms with the Emperor Frederick I in the vexing question of the appointment to the See of Magdeburg and closed the long quarrel, which had raged through four pontificates, about the appointment of William Fitzherbert (commonly known as Saint William of York) to the see of York by sending him the pallium in spite of the continued opposition of the powerful Cistercian order. Pope Anastasius IV died on 3 December 1154 and was succeeded by Cardinal Nicholas of Albano as Pope Adrian IV. ↑ Tillmann, H. (1972). "Ricerche sull'origine dei membri del collegio cardinalizio nel XII secolo". RSC. 26: 313–353 [p. 328]. ↑ Anastasius IV is sometimes referred to as a nephew of Honorius II, but this is not proven and is very unlikely; Anastasius IV came from Roman aristocracy, while Honorius II was a Bolognese. Brixius, p. 78 rejects the statement about relationship between Anastasius and Honorius as without foundation and adds that it appears for the first time in the 16th century. Hans Walter Klewitz and Helene Tillmann, who have made an extensive study about the origins of the cardinals of the beginning of the 12th century, either deny or do not mention this relationship. ↑ Chisholm, Hugh, ed. (1911). "Anastasius". Encyclopædia Britannica (11th ed.). Cambridge University Press. Klewitz, Hans Walter (1957). Reformpapsttum und Kardinalskolleg. Darmstadt. pp. 128 no. 31 and p. 220. Brixius, Johannes M. (1912). Die Mitglieder des Kardinalkollegiums von 1130–1181. Berlin. Robinson, Ian Stuart (1990). 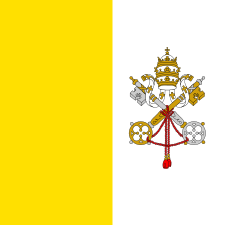 The Papacy, 1073–1198: Continuity and Innovation. New York: Cambridge University Press. ISBN 0521264987. Jaffé, Philipp (1851). 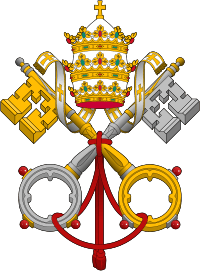 Regesta pontificum Romanorum ab condita Ecclesia ad annum post Christum natum MCXCVIII. Berlin.